Inside Grand Republic bar at 19 Greenpoint Ave.
One of the most atmospheric bars in Greenpoint is the quaint cocktail club Grand Republic (19 Greenpoint Ave.), and it’s a great place to enjoy a cocktail amongst nautically themed décor. Owner Johnny Swet must know a thing or two about local history because he named his bar after a famous ship, built only a few feet away from the bar in the John Englis Shipyard, which once stood on the ground that is now occupied by Transmitter Park. A striking painting of the once-famous ship occupies a prominent position behind the center of the bar, but few patrons probably know the strange history of the once celebrated paddle wheeler. One of the great achievements in the history of local shipbuilding was the construction of the huge side-wheeler boat in 1878. Shipbuilding was the first major local industry and once shipyards lined West Street, employing hundreds of locals. The Grand Republic, one of the largest boats ever to be built locally, weighed an amazing 1,760 tons. The steamboat made almost completely of wood, required a veritable forest of trees had to be cut and sent down the East River to construct her. The ship was 281 feet long and 41 feet wide, but its defining feature was a huge paddle wheel that was 36 feet in diameter. The elegant ship was called “ The queen of the harbor” until her sister ship, the infamous General Slocum, was launched in 1891. The Grand Republic was for many years the pride of Brooklyn and it served as an elegant excursion boat, taking hundreds of passengers on day trips to the Rockaways and other locations, but its reputation was blackened when an infamous accident befell its sister ship. On June 15, 1904, the Slocum left the Lower East Side on a journey up the East River with an estimated 1,342 people on board. Most of the passengers were German-American women and children, very few of whom knew how to swim. The life preservers on the Slocum had been exposed to the elements outside on the deck for 13 years and most of them were falling apart, but still, the ship passed inspection. A fire started on the ship and spread rapidly. Terror engulfed the passengers when they learned of the rotted state of the life preservers. 1,0021 people died, many of them drowning in sight of the banks of the East River. Two of the victims were German-Americans from Guernsey Street. Sailors are a superstitious group and the Grand Republic was forever tainted for being the Slocum’s sister ship. The Grand Republic was inspected and the state of its life preservers was found to be equally as bad as the Slocum’s. Its passenger capacity was reduced, but it was allowed to sail. In 1910, a fire also broke out on the Grand Republic, but thankfully a tragedy was avoided. The steamer was also involved in a collision and other accidents, giving credence to the superstitions of sailors. The following year in 1911, the Englis yard closed, bringing to end the era of Greenpoint shipbuilding, but the unlucky shipped still sailed. Eventually, the Grand Republic was sold and ended up in the Hudson River, running day trips for many years to Bear Mountain. 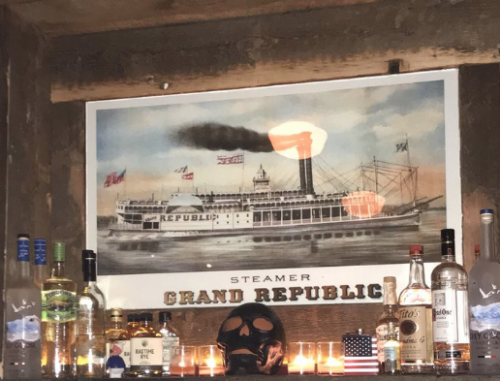 Ironically, the new owners of the Grand Republic were a Greenpoint family, the McAlisters, who had become the tugboat and excursion boat kings of New York harbor. One of the bouncers the McAlisters hired on the Grand Republic was Peter McGuinness who would later dominate local politics for decades and lend his name to Greenpoint’s widest boulevard. In 1924, Grand Republic burned in a spectacular fire while it was moored at 150th Street in Manhattan. 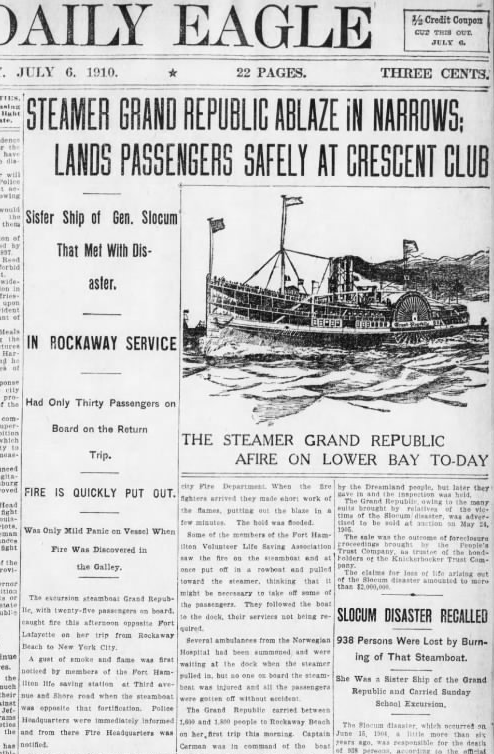 Unlike the fire that consumed the Slocum, the burning of the ship led to no loss of life. Tens of thousands of people watched the blaze as the flames that consumed the giant ship lit up the night sky. The picture in the banner (and above the bar) are of the wrong Grand Republic. 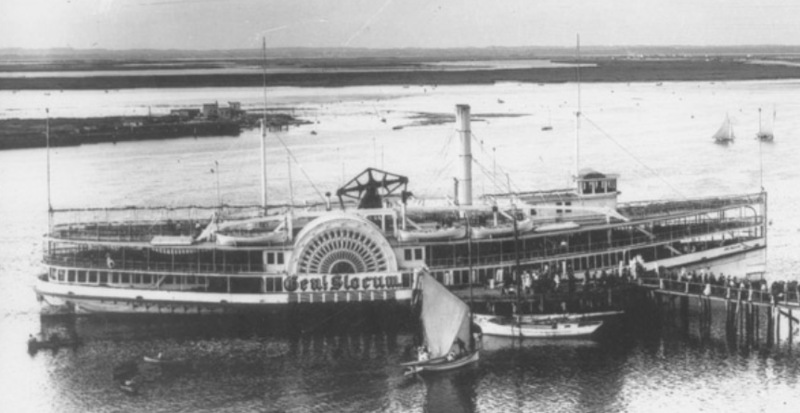 The one pictured was a Mississippi River steamer doing excursions out of St. Louis. If you want to get a free drink in The Grand Republic bar at the foot of Greenpoint Ave., sign up for rental tour of the new lux. rental tower at the foot of Franklin St. now in operation. The two have a promotional agreement. The lux rental tower is called Blue Slip or something. I call it the Gold Coast, beautiful public views on a promenade of all of Manhattan and LIC.